Rob Tillett, astrologer and publisher of Astrology on the Web, gives a short description of the astrological meaning of the Sun, our very own star, the cosmic sustainer for all who dwell on planet Earth. The Sun, the life-giving heart of our solar system, has been the supreme object of veneration and worship in every culture since long before the beginning of civilisation. Called Helios by the ancient Greeks, Sol by the Romans, and Surya by the Vedic peoples, it warms us, lights us, and supplies the power that keeps us alive. Christianity itself is basically a solar religion—and even today we have our Sun-worshippers, even if they are just frying on the beach! Astrologically, the Sun rules will and individuality. It lies at the core of our potential and uniqueness as an individual: who we are and what we are about. It represents the main direction and focus you want your life to take and your determination to accomplish what you set out to do. The Sun's position in your horoscope demonstrates the depth of your personal honesty and integrity, the ability to command respect and authority, to impress and influence others. It indicates the stamp of your character, the deepest flavour of your individuality. Your Sign (Sun Sign) is the Zodiac Sign that the Sun was in at the time and place of your birth. There are twelve Signs of the Zodiac, each one symbolising a stage on the cosmic journey of life, presenting a personality type and a pattern of typical life-styles, relationships and karmic experiences. Each Sign is made up of thirty degrees, the twelve signs together comprising the 360 degrees of the entire zodiac. The Sun travels about a degree a day and so gets right through the zodiac in a twelve month period. The Sun in partnership with the Moon creates and nurtures all life on our small planet. From the eclipses to the tides, from feeding the plants through photosynthesis to creating electricity through solar panels, the power of the Sun is central to our existence. Even oil and coal are concentrated solar energy! Its relationship with the Earth even creates the seasons, something which is central to the structure of the Tropical Zodiac we use on this site. Astrophysics tells us that the Sun is a mighty nuclear furnace, so vast that it could contain more than one million planetary bodies the size of the Earth! If you think of the Sun as a basketball, the Earth is the relative size of a pinhead! It also tells us that the Sun's gravitational field, and the limit of its radiant energies (the "Solar Wind") extend to the outermost limits of the solar system, some 6 billion kilometres. The Sun is over 93 million miles (149,680,000 km) from the Earth, so far away that it takes the sunlight 8 minutes to arrive here. It is the Sun that holds the solar system together, energising and vitalising the planets, moons, comets, asteroids and beings that dwell within the range of the Sun's power. Effectively, we live within the Sun, thanks to these radiant fields, though not of course within the nuclear heart of the Sun, which is so hot that it could vaporise the Earth and everything on it in a flash. 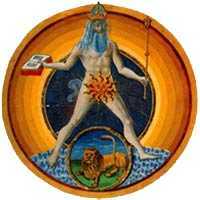 The Sun is the traditional ruler of Leo (dramatic; generous; egotistical), and is exalted in Aries (leadership; drive). People with these signs prominent in their charts are said to be ruled by the Sun. The colours of the Sun are amber, orange and red (some say purple too); his metal is gold, and his gem is the ruby.